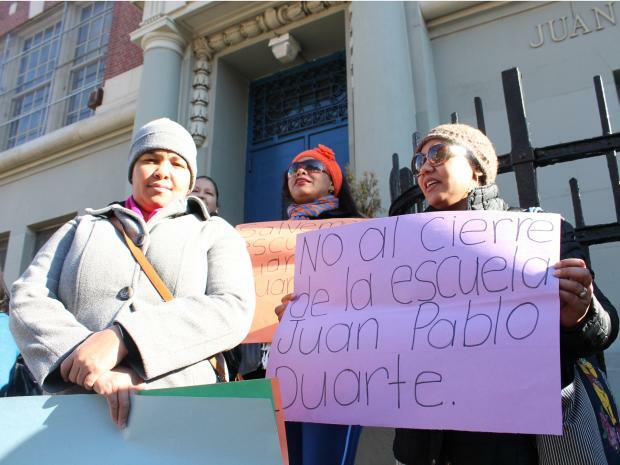 WASHINGTON HEIGHTS — Dozens of parents, supporters and advocates picketed Friday in Washington Heights to protest the closing of P.S. 132 Juan Pablo Duarte. Armed with signs that read "Save 132M Juan Pablo Duarte," in Spanish, the crowd demanded that Mayor Michael Bloomberg and Department of Education Chancellor Dennis Walcott back away from plans to close the 793-student school. "We want the mayor and the chancellor not to close this school," said Luis Tejada, executive director of the Mirabal Sisters Community Center, the nonprofit that organized the protest. "This school is important to the community." P.S. 132 is one of 36 public elementary and middle schools that the Department of Education is eyeing for closure. The school has has received a "D" grade on the DOE's progress report cards each of the past two years. But advocates say that years of budgets cuts have left the school, which counts 53 percent of its students as English language learners (ELL), is unfairly penalized. Efforts by the parent leaders to reach out and discuss the closure with Education Department officials have thus far been ignored, parents said. "The people of this community are very concerned about how the school has been abandoned because they've removed the money. We want the mayor to put the money back." "We don't have a lot of after-school programs," said advocate Roberto De La Rosa after he addressed the protestors. "Parents suffer because they don't know who's going to pick up the after-school programs." Tejada said that this rally, the third since P.S. 132 was placed at risk, should be a wake-up call to the elected officials, who he hoped would visit the school and see the conditions firsthand. "We want the chancellor to come to the school and listen to parents. If he decides not to come, then next week we're going to go down to him."